The Entertainment Software Association has released their annual report about video game consumption and demographics. 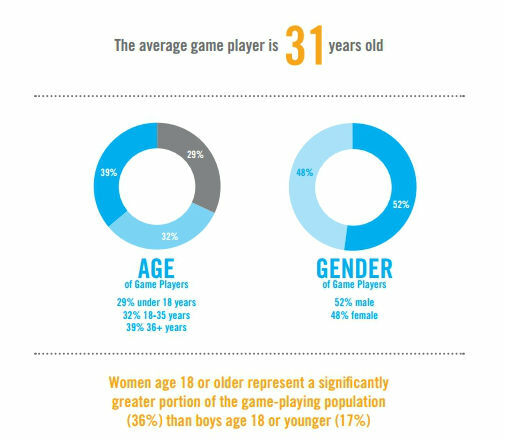 For those new to the ESA, these statistics are gathered by the foremost collectors of video game demographics and stats in the industry. Here is the entire report for 2014 in PDF Form. Give it a read, it’s quick and very easy to read. The ESA is super helpful for anyone interested in video games and sociology, as they do all the grunt work to figure out gaming population and trends. Last year I posted the 2013’s report in some dept, but let’s see what has changed, stayed the same, or is new. The number of people playing video games has increased! Compared to last year, the percentage of people playing video games has increased from 58% to 59%. That means more and more gamers are becoming the norm. Digital sale of video games have surpassed physical sales of video games. What does this mean? This means that less physical games were sold in 2013 than digital video games. This is majorly due to the increase of popularity of mobile apps and online digital purchases, but it is interesting nonetheless. Now that it is easier to download games online over avenues such as the app store or Steam it is becoming more and more apart of the norm. The industry is steadily growing to be a more adult one, with AAA titles mainly being made for gamers 16+. That said your average gamer is still an adult male, but more and more women are becoming apart of the gaming sphere; they’re really closing in! This could be in part due to the increase of popular mobile games aimed and women and girls, but also due to women becoming PC and Console gamers as well. That’s all I’ll say about this years findings for right now, but please do go and read the ESA’s finding for 2014: they have an array of information from demographics to sales. I’ll try and edit or expand on these demographics and stats in the near future. This entry was posted in gaming, Uncategorized, video games and tagged esa, Gaming, sociology, stats, Video Games. Bookmark the permalink.